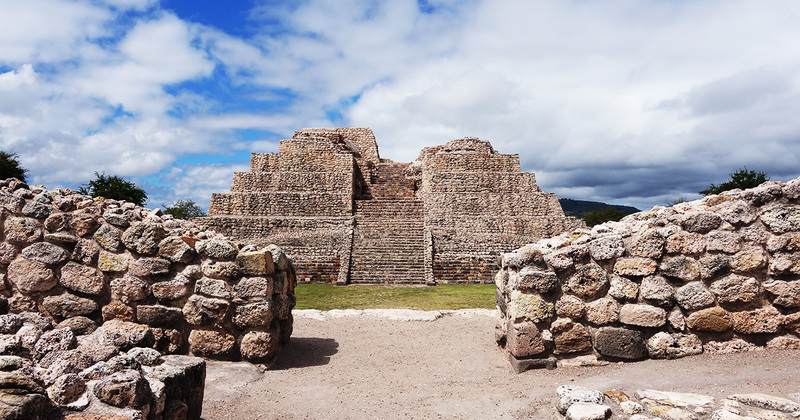 One of Mexico’s best-kept secrets, the Cañada de la Virgen archaeological zone has only been open to the public since February of 2011. Since then, Albert Coffee has taken thousands of people on his academic-level introduction to the pre-Hispanic history of Mexico through visits to the site which he was invited to help excavate. The site itself is a true testament to the mathematical, astronomical and architectural genius acquired over thousands of years by its builders and their ancestors. The House of the Thirteen Heavens, the House of the Longest Night and the House of the Wind are three of the main structures. Occupied between 540 and 1050 A.D., they served as ceremonial spaces, elite residences, burial grounds and time keeping instruments that are aligned precisely to the movements of the celestial bodies. The site was also a pilgrimage destination for common people who brought in tribute to the elite astronomer priests who lived and died there and used the place as a refuge, an observatory and possibly even an astronomy school. Don’t miss this most informative, accurate and well-presented tour of the site. Tours run at 9 am, Tuesday through Sunday. The site is closed on Mondays. Includes: All transport, entry fees, Albert Coffee as guide through the archaeological zone. The Museum of Prehispanic Astronomy explores the cycles of the Sun, Moon, Venus and the constellations from the viewpoint of Cañada de la Virgen. The museum uses lightboxes, 3D and lenticular images to allow visitors to immerse themselves in the world of Mesoamerican astronomy. This museum was developed by Dra. Rossana Quiroz Ennis, head of the Celestial Observation Program at Cañada de la Virgen, who has spent nearly ten years researching this fascinating topic. Ask about the best horseback excursions available anywhere through the scenic canyon and working ranches located near the pyramids! Hikes, birdwatching and other ecological and cultural tours through the surrounding countryside are also available. No bags or backpacks will be allowed into the site because of recent thefts of artifacts. Small camera bags, cameras and water are ok. Bags can be left in the vehicle or with site staff at the visitor’s center. Hats, sunblock and comfortable walking shoes are recommended as there will be about 3 km of walking to do. Please provide a phone number where you can be reached here in San Miguel, preferably a cell phone.